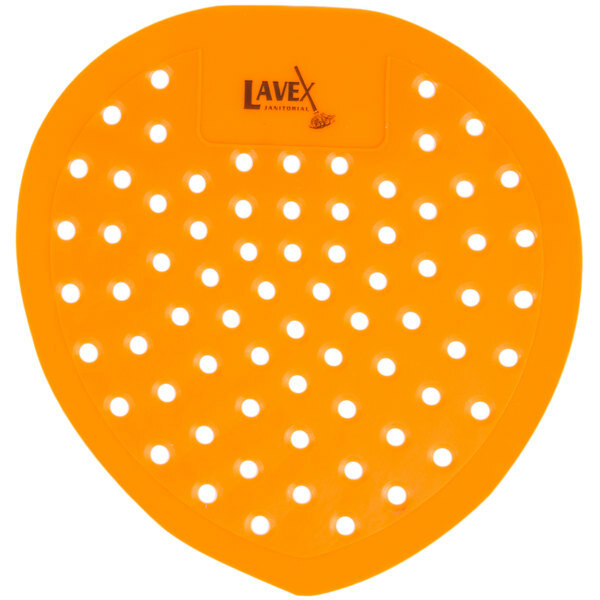 Eliminate unwanted odors from your restroom with this Lavex Janitorial citrus scent deodorized urinal screen! 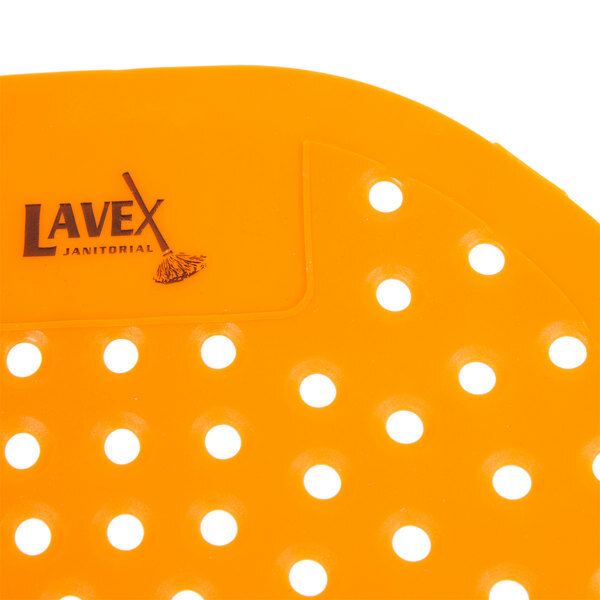 If you are hoping to enhance your restaurant or bar's bathroom environment, there is no better way than with this Lavex Janitorial citrus scent deodorized urinal screen. By instantly eliminating persistent odors at their source, this deodorant urinal screen promotes a clean environment and let's your guests know that you care about every aspect of their experience in your establishment. "Great product at a great price. The scent is great and they last around 30 days. The glove is included as well and makes changing them out a snap." 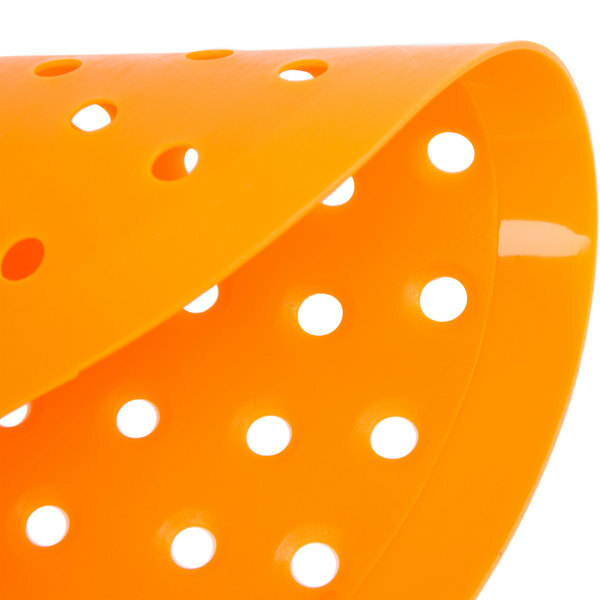 This vinyl urinal screen emits a pleasant citrus scent to counteract the unpleasant smells often associated with bathrooms. The clean smell will help put your guests at ease without being too overpowering. To use, simply place it on the bottom of the urinal in your bathroom. It begins working immediately and offers up to 30 days of built-in deodorant protection! 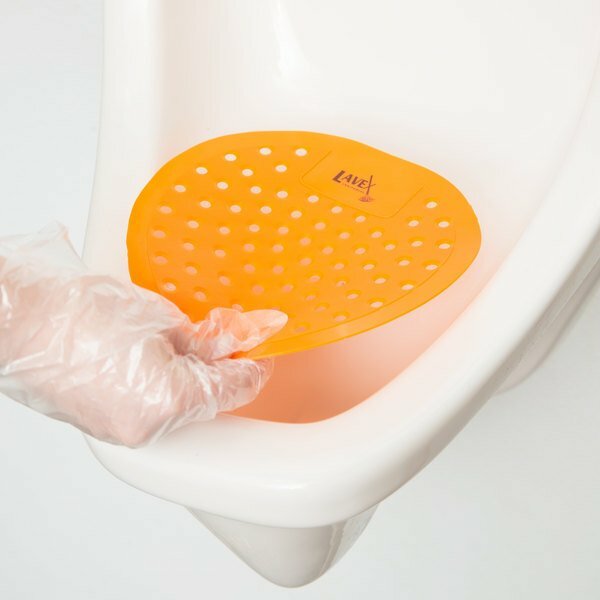 A clear, disposable glove is included with each urinal screen for sanitary placement and removal. This urinal screen's vinyl design offers the flexibility needed to fit most urinals for the ultimate convenience. 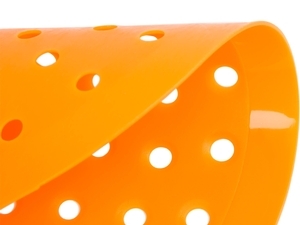 Its perforated design allows liquids to pass through while effectively providing drainage protection from unwanted substances. Plus, this screen won't flake or disintegrate like toss blocks. These last quite awhile, but the citrus scent doesn’t hold as long as I was hoping for. I like them to double as an air freshener for as long as they can. These scented deodorized screens work well for their purpose. The price on the 12 pack is also incredibly affordable compared to others out there. We will definitely continue the use of this product. I just started purchasing these and am changing them every 2 weeks. They do help with the men's room smell and seems to help with the fruit flies. These urinal screens emit a very nice smell for our urinals and have lasted a good amount of time. They tend to fade a bit once it is time to replace, will buy again. NIce scent upon initial use, but hoping it will last for the 30 days. Fits well in the gerber urinal and also acts as a drain filter. The price of these screens is really competitive. The fragrance is not too overpowering and they hold up quite well. These screens don't seem to mold as fast as other brands we've tried in the past. These product have really helped keep our men's restroom cleaner and smelling nice. we have gotten compliments about how the clean the bathrooms smell. Highly recommend! These lavex urinal screens are the best ones by far. They are so strongly scented that it makes the bathroom smell like the scent. They last such a long time and the price is great for the 12 pack. 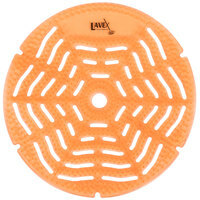 Lavex Janitorial Citrus Scent Deodorized Urinal Screen is a great item! You just can't beat citrus that's known for eliminating odors in a bathroom, very happy with this item! The Lavex Janitorial Citrus Scent Deodorized Urinal Screen has worked very well. The scent is not too overpowering but offers a great clean refreshing smell. I would order this again especially if there would be bulk purchasing options. I would highly recommend this citrus orange scent. What we pay is what we get, it is cheap but the quality is not good. It does not have strong scent. I would not recommend this product. I have been really surprised how such an affordable screen can actually provide a nice scent. It is not overbearing like you find in many bathrooms, it is very subtle and long lasting. 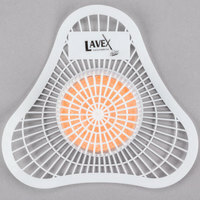 This along with the other Lavex screens will likely be all I buy from here on out. these work great in my restaurant, I was looking for a reasonably priced urinal screen that did not have an overpowering or gross smell. These fit the bill perfect, they smell great and are subtle , no overpowering smell, if your bathrooms need an overpowering smell chances are you need to clean! great product at a great price! Simple design and they came at a great price in a huge pack so you can throw them away frequently and not worry about it. We use these in our urinal in our detached garage urinal. It smells just like citrus scent as last quiet awhile. Lavex offers many different scents. These urinal screens are a great way to keep urine odors down in the men's restroom. Just place in the bottom of the urinal and that is it. Replace weekly. These urinal screens are good quality. They hold up well in a commercial setting. The citrus smell is refreshing and keeps the public restroom smelling great. The nice thing is that if you are willing to do janitorial yourself, this website has it all and will save you a fortune. These are great for that reason. Great product at a great price. The scent is great and they last around 30 days. The glove is included as well and makes changing them out a snap. These are a little pricier than what we pay for the cherry kind that is available through our food purveyor but these smell nicer! I wouldn't say the scent lasts a long time, maybe a day for a higher volume place. It is very nice however that there is a glove included with each pack, it offers quite a bit of convenience and quick install when you're in a hurry. For the higher price though, since the scent doesn't last a long time for us, I probably couldn't justify the purchase in the future. These smell great and definitely improve the air in our men's room. Securely packaged to stay fresh until ready to use, plus they come with a disposable glove already attached for easier placement and removal! Walk into my bathroom and what's that smell? Lavender? Orange peels? Something pleasant and the exact opposite of urine? 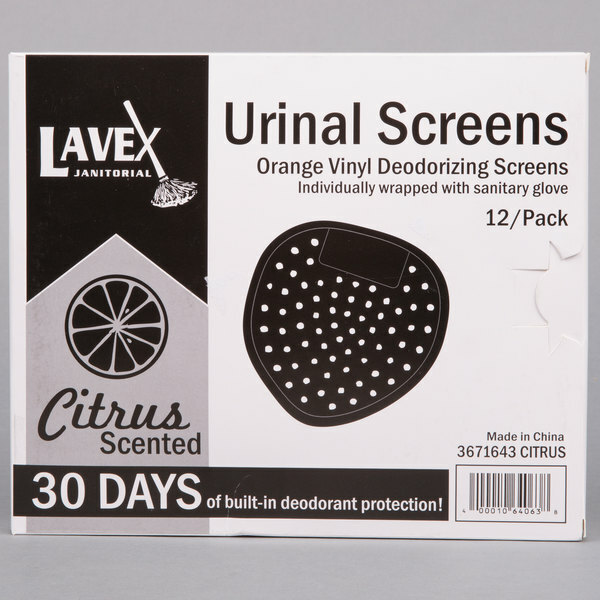 Nope, that's just my Lavex Janitorial Urinal Screen, masking any and every unwanted odors with the refreshing scent of citrus. I have been using these urinal screens for about 2yrs. now and the work great. Long last for about 45 days. Has a very nice and light scent of citrus.. I really like that they come with a plastic disposable glove. Overall a great product, these are very inexpensive compared to competitors, smell is very nice and strong enough to fill the bathroom, will continue to purchase these and use them in our bathroom!!! We've all heard it or said it . . . the restroom is an indicator of how clean the whole restaurant is, including the kitchen. It should not be an unmentionable subject, you simply need those restrooms fresh and clean to maintain your business. These lav screens have just the right amount of scent, and very economically priced too. What can I say they work and keep the smell down in the mens restrooms. We had had a problem with smell coming up the pipes and these helped out uptil the pipes were fixed.